Getting lost in trying to get found. In the absence of leadership...real leadership...any noise that is loud enough can fill the void. Fans of the Memphis Grizzlies know that silence, sometimes, can be the most deafening sound of all. 14 games played (14 started), 31.6 minutes per game, 16.1 points per game, 46.3% field goal shooting, 38.4% three point shooting, 13.4 shots per game, 14.5 PER, 109.4(!) offensive rating, 110.4 defensive rating. 44 games (39 starts) with Memphis Grizzlies: 9.5 PPG, 3.5 RPG, 1.4 APG, 1.2 SPG, 38.9 FG%, 33.3 3PT%, 8.9 PER. Jaren Jackson Jr. brought some hope to a bleak season for the Memphis Grizzlies. Jaren Jackson Jr.
58 games played (56 started), 26.1 minutes per game, 13.8 points per game, 50.6% field goal shooting, 4.7 rebounds per game, 16.4 PER, .105 win share per 48 minutes, 100.5 offensive rating, and 102.4 defensive rating. With the fourth pick overall in the 2018 NBA Draft, the Memphis Grizzlies select Jaren Jackson Jr. out of Michigan State University. Grind City Media’s Chris Vernon and GBB’s Colin Griffith join Host Joe Mullinax on the latest episode of GBBLive!Three days, three podcasts. GBBLive is doing big things of late, and this episode is certainly no different. Listen to the show in the player below or via this link. Time to get real. The Memphis Grizzlies are hiring...again. In Part I, which you can read here if you missed it, we broke down the situation for Memphis when it comes to the inexperienced new front office and how it will be on Zachary Kleiman, Jason Wexler, and the other remaining Grizzlies brass to sell any future head coaching candidate on the opportunities present in Memphis. Jaren Jackson Jr. is enticing, but beyond that? Crickets...depending on what happens with Mike Conley. We hardly knew ye. For the rest of the month, GBB will be breaking down every Grizzlies player that logged double-digit game appearances for Memphis this season and what their games need moving forward. Welcome to the 2018-2019 Memphis Grizzlies Player Review series! It’s nice to dream. The Memphis Grizzlies are hiring...again. Change is in that air over at 191 Beale Street. The Grizzlies front office has been overhauled (once more...again), and Zachary Kleiman and Jason Wexler have been empowered with figuring out just what the future of the Memphis Grizzlies looks like. Spring Break is the best! Another day, another episode of the flagship podcast of Grizzly Bear Blues, GBBLive! Listen to the show in the player below or via this link. Go win a ring big fella For the rest of the month, GBB will be breaking down every Grizzlies player that logged double-digit game appearances for Memphis this season and what their games need moving forward. Welcome to the 2018-2019 Memphis Grizzlies Player Review series! C.J. Miles proved to be much more than trade filler.For the rest of the month, GBB will be breaking down every Grizzlies player that logged double-digit game appearances for Memphis this season and what their games need moving forward. Welcome to the 2018-2019 Memphis Grizzlies Player Review series! On Spring Break, some like to go on vacation. Others enjoy a nice chance to catch up on sleep, or house work. I, ladies and gentlemen, blog and podcast my little heart out. Oh captain, my captain For the rest of the month, GBB will be breaking down every Grizzlies player that logged double-digit game appearances for Memphis this season and what their games need moving forward. Welcome to the 2018-2019 Memphis Grizzlies Player Review series! -The Memphis Grizzlies fired head coach J.B. Bickerstaff and demoted GM Chris Wallace to a scouting role. ESPN’s Adrian Wojnarowski first reported the front office re-shuffling. Hold on to your butts. The tiebreaker has spoken. The Memphis Grizzlies will be slotted at #8 overall in the 2019 NBA Lottery. So...what is next? Thursday, April 11th, 2019 will go down in history for the Memphis Grizzlies franchise. Well...that escalated quickly. Thursday, April 11th, 2019 will go down in history for the Memphis Grizzlies franchise. There’s no money in despair If you were watching game number 82 for the Memphis Grizzlies last night, you would have seen a lot of unusual things. You would’ve seen, as Peter Edmiston of The Athletic put it, “the highest-quality Summer League game” ever. You would’ve watched, jaw dropped, as Memphis scored 86 points in a single half of basketball. Has he shown enough to warrant the Grizzlies retaining him for a second year? As it pertains to the NBA’s coaching carousel, there is an old quote from Stephen A. Smith that describes the Memphis Grizzlies so incredibly well . After the firing of David Fizdale, he gave several reasons for why the Grizzlies fired him. But the main reason behind it, as Stephen A. believed, was simple. The only way for this season to end - stupidly. Of course the broken Memphis Grizzlies blew out the skeleton crew of the Golden State Warriors 132-117. 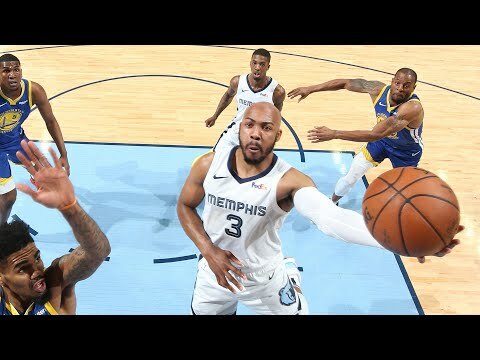 In what was a perfect way to end this random and stupid season, Memphis lit the Warriors up like a Christmas tree in April, scoring 86 points in the first half and making 20 total threes (a new franchise record) on their way to a victory in the finale of the 2018-2019 campaign for the Grizzlies. The journey was fun, even if the destination wasn’t Most end-of-the-season games don’t really matter to most teams. They’re typically either resting up for the playoffs, or full-on tanking for the draft. The Grizzlies and Pistons are in a unique situation. Detroit is fighting for their playoff hopes while Memphis is playing to convey their pick.